This new edition of Sergei Malyshev’s pamphlet should be of more than historical interest. 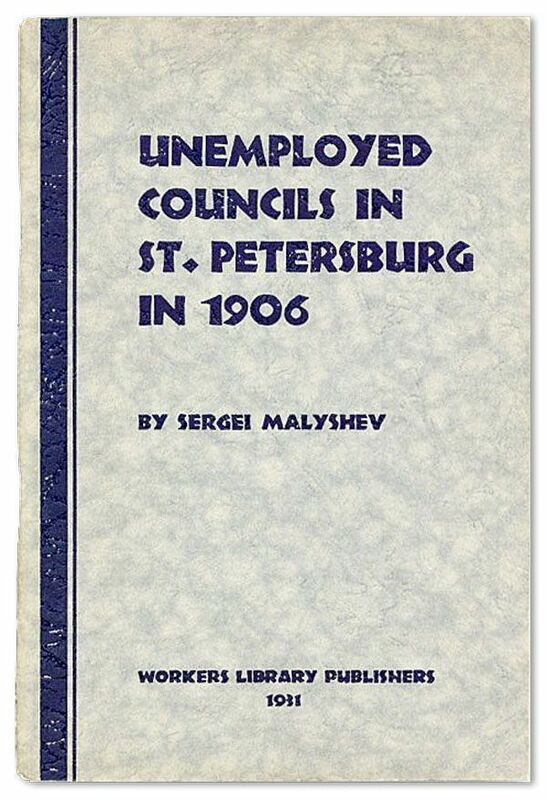 First issued in 1931 at the depth of the world slump under the title Unemployed Councils in St Petersburg in 1906, it deals with an important episode of Bolshevik history which few other works touch on. Although its author was no theoretician, the interest of the pamphlet lies in its vivid account of the practical experiences made by Bolshevik organisers among the unemployed in the aftermath of the 1905 revolution. Its relevance today, in the midst of a deep international recession with vast reservoirs of ‘conjunctural’ and ‘structural’ unemployment, should not be lost on any serious socialist. Long-term, large-scale unemployment saps the strength of the working class. It weakens its mass organisations. It carries the danger of demoralisation, despair and atomisation. Under circumstances where revolutionary leadership is weak or non-ex stent, or commits fatal errors (for example, Germany in (1928-33), unemployed workers can lose all confidence in their own class organisations and fall prey to fascist demagogues. Today, the failure of ‘socialist’ and ‘communist’ led trade unions to mount any concerted, or even limited, fight against redundancies, and their cynical abandonment of the unemployed, leads in country after country to a dangerous breach between organised workers and those thrown out of work. Statistics published in January 1992 by the Organisation of Economic Co-operation and Development revealed the following unemployment levels, expressed as a percentage of the national workforce: Japan – 2.1; Sweden – 3.4; German y – 4.3; USA – 7.0; France -9.8; Australia – 10.2; Canada – 10.3; Finland – 10.5; U K – 10.6; Ireland – 16.8. In semi-colonial countries, unemployment rates of 50 per cent are not uncommon. Unemployment among ‘African’ workers in South Africa is at a similar level. The pauperisation of large numbers of peasants and rural workers in Latin America, Africa and Asia and the collapse of the nationalised economies of eastern Europe and the ex-Soviet Union have added explosive new ingredients to the international picture of unemployment. Malyshev’s account of Bolshevik work among the unemployed gives valuable illustrations of the practical application of transitional demands. It shows how the call for a programme of public works was related to the slogan of workers’ control, thus becoming in Trotsky’s words, ‘a school for planned economy’. No less important was the exemplary manner in which antagonisms between employed and unemployed were overcome, through the combined struggle of the trade unions and the unemployed workers’ councils. The fate of the unemployed cannot be left in the hands of trade union bureaucrats, who in periods of crisis are concerned least of all with anything beyond their immediate sphere, or of reformist politicians who passively wait for an upturn in the economy. The creation of fighting organisations of the unemployed, linked to the trade unions, is a key task. Such organisations must set their sights well beyond the horizon of advice and employment counselling, and establish unity in action with other sections of workers. Agitation around demands for public works, for adequate unemployment benefits, for low-cost housing and for training under the control of the trade unions must be combined with propaganda which firmly locates unemployment within the context of crisis-ridden capitalism. Unemployment is not an act of god. It can and must be fought. If reprinting of this pamphlet contributes to the development of unemployed workers’ struggles it will have served its purpose. By any standards Sergei Vasilevich Malyshev (1877-1938) was a fairly minor figure in the history of the Russian revolutionary movement. References to his career are few and far between; 1 he is mentioned only four times in Lenin’s Collected Works and not at all by Trotsky. Neither an oppositionist nor active in the international communist movement, he seems to have played no role after the revolution and the civil war other than as a middle-ranking economic administrator. 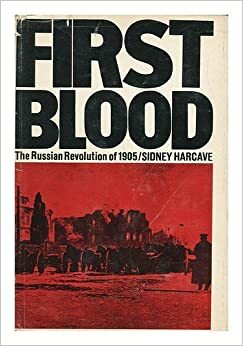 Nevertheless, when he wrote this pamphlet, the Stalinist falsification of revolutionary history had not completely overtaken memoir literature. Malyshev’s father is referred to variously as a baker and a poor peasant. Between 1891 and 1896 Malyshev worked as a tradesman, subsequently becoming a factory worker at the Obukhov plant in St Petersburg. He joined the RSDLP in 1902, and in 1903 moved to Odessa where he joined Lenin’s lsra group. During the 1905 revolution, he became chairman of the Kostroma soviet. The defeat of the revolution saw his departure for St Petersburg – his work among the unemployed during this period, documented in the present pamphlet, led to his arrest and imprisonment. He returned to St Petersburg in 1913, becoming a secretary to Pravda. In 1920-21 he was a member of the Revolutionary Military Council of the Turkestan front. Du ring the turn to NEP and the negotiations connected with the pol icy of allowing limited foreign capitalist concessions, Malyshev is mentioned by Lenin as being one of ‘only two communists who have shown an ability to trade’. 3 Other posts he held included: member of the Labour and Defence Council (1921-22); chairman of the lrbit and Nizhni Novgorod Market Committees (1925- 30); member of the collegium of the People’s Commissariat for Internal and External Trade (1930-33); member of the Committee for Agricultural Procurements (1933-34); member of the Central Council of Consumer Co-operatives. He is reported to have died of natural causes in 1938 – although for a senior official to die of natural causes at the height of the purges, especially one with agricultural connections, was a rarity. Most of the following material is drawn from: J.L. Wieczynski (ed. ), The Modem Encyclopaedia of Russian and Soviet History, vol. 21 (Academic International Press, 1981); R.W. Davies et al, Soviet Government Officials 1922-41: A Handlist (Birmingham, 1989); H. Schulz et al (eds. ), Who Was Who in the USSR (Scarecrow Press, 1972). V.1. Lenin, Collected Works, vol. 44 (Moscow, 1977), p.132. V.1. Leni n, Collected Works, vol. 45 (Moscow, 1976), p.437. Twenty-five years ago, in April, 1906, the first St. Petersburg Soviet of Workers’ Deputies and the Moscow armed uprising were suppressed by the tsarist government. It was then that we, a group of Bolshevik workers and intelligentsia, at the decision of the Bolshevik Party organization, created a new proletarian revolutionary organization in St. Petersburg. We organized the locked-out masses of unemployed and established a general staff for this army-the St. Petersburg Unemployed Council. Our party also tried to organize the unemployed in other industrial centres, such as Moscow, Odessa, etc., but these were short-lived: they were suppressed at the end of 1906. But in St. Petersburg, this organization of the unemployed fought the bourgeoisie and the government for more than two years, and was only destroyed by the secret pol ice and gendarmes in 1908. Twenty-five years ago, unemployment was artificially created in tsarist Russia to teach the revolutionary workers a lesson. A lockout was declared towards the end of October 1905, and all factories and mills, both state and private, were closed. Thus, the government and the bourgeoisie threw hundreds of thousands of workers and their families in St. Petersburg, Moscow, the Urals, Kharkov, Odessa, and other cities into the clutches of hunger and poverty. But the rulers of Russia were not satisfied with this. They were always finding new ways in which to punish the revolutionary proletariat. The lockout was not enough. 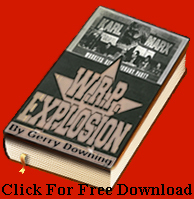 The government organized gangs of the so-called Black Hundreds and incited them to attack the workers’ organizations and individual workers in their homes with rifle and bombs. Battles were fought in almost all the districts of St. Petersburg and in other cities as well. But the activity of the Black hundreds only stimulated the workers to strengthen their organisations of self-defence, and the Black Hundreds were severely repulsed. The lockout which had been declared in St. Petersburg at the end of October, 1905′, continued until April, 1906. It was limited by the rulers of Russia and the principal leaders of industry — Ryabushinsky, Gukasov, Nobel, Denisov, and others. And naturally, this and the other means adopted to fight the working classes and teach them a lesson was extra, ordinarily well organized. At first, the Soviet of Workers’ Deputies took the responsibility for the tens of thousands of workers thrown out on the streets by the lockout. But as soon as the Unemployed Council was organized it took charge of the movement, and registered all the locked-out workers. This registration revealed an interesting fact-that 54 per cent. of the workers who had been locked out were highly skilled workers, metal workers; 18 per cent. were joiners, carpenters, stone masons and of other skilled occupations; and that only 21 per cent. were common labourers. These figures showed that the capitalists vented their wrath on those who fought in the front ranks of the working class. The Soviet of Workers’ Deputies was faced at the beginning of the lockout with the problem of finding some way in which to help the unemployed who were hungry and poverty-stricken. Those early months, October, November and December of 1905, had to be devoted largely to questions concerning the unemployed, for, important as the political question was, hunger was making itself felt with increasing force, even though it had not broken the proletarian will to struggle. Questions on how to help the unemployed were raised at almost every meeting of the central revolutionary proletarian paper. It was at the suggestion of the Bolshevik group of the Soviet of Workers’ Deputies that a commission of unemployed was organized, which opened departments in all the working-class districts of St. Petersburg. Later the commission adopted the resolution of the Soviet of Workers’ Deputies to deduct one per cent. from the wages of all the workers at the factories, mills, and other institutions, for the unemployed. They also organized a voluntary collection at all meetings and gatherings. These and other measures brought into the Soviet of Workers’ Deputies and its commissions some tens of thousands of roubles and made it possible for the commission of unemployed to take some real steps to help the unemployed. A number of dining, rooms were opened in the St. Petersburg districts. Workers with families were given suppers to take home while unmarried workers ate in the dining-rooms. Besides, the commission of unemployed gave financial relief to the workers and their families: 30 kopeks a day for each adult, and 15 and 10 kopeks for children. Liberal groups in St. Petersburg also opened dining-rooms for the unemployed because elections to the State Duma were then approaching and they wanted to benefit politically by giving help to the unemployed. The Duma must take immediate measures to regulate the supply of food to the numerous masses of workers. It must assign buildings for meetings. It must cease bringing gendarmes, police, etc., into buildings. It must give an account of how the sum of 1’i,000 roubles, which it received for the workers of the Narvsky district, was spent. It must release sums of money from the public fund, which it has at its disposal, for the needs of those fighting for the freedom of the proletariat, and for the students who went over to the side of the proletariat. It must take immediate measures to withdraw the soldiers from the city water works and place the buildings at the disposal of the workers. On October 16, at 2 p.m., when the delegation from the Soviet of Workers’ Deputies arrived at the City Duma, large detachments of armed police met it in the building, and a company of soldiers was on the staircase of the Duma. The town councillors had been warned by telephone of the proposed visit of the delegation from the Soviet of Workers’ Deputies and had not come to the session. Instead, a number of members of the Committee of the Duma received the delegation, heard what they had to say, asked them to clear out, and then, in their absence, decided to refuse all the demands. And it could not have been otherwise. The mayor, the members of the administration and the councillors of the City Duma were all powerful capitalists or their representatives ­ lawyers, directors of factories and mills, landlords, judges and other officials; the very ones who had locked out the workers. In January, 1906, unemployment, want, and hunger grew even more intense. The semi-legal commission of the unemployed worked feebly because it had no money. Money had almost stopped coming in. The locked-out workers had sold their last belongings and were finally faced with starvation. After the defeat of the uprising in Moscow and other cities I had to leave Kostroma where the terrorism of the Black Hundreds and the armed forces had compelled the Kostroma Soviet of Workers’ Deputies to liquidate its activity and go underground, and I-its president-was forced into hiding. On a locomotive, in a soiled jacket and cap, with a grimy face, I was gotten out of Kostroma by some comrades -railroad workers. I determined to go to St. Petersburg where our Bolshevik Party centre was situated, for it was essential to give it a detailed report on everything. Besides, this proletarian capital-St. Petersburg-was more suitable as a place to live underground since I had worked in factories there and had also carried on Bolshevik work underground. It would also be easier for me to hide myself and get a night’s lodging from the workers there than in any other city. On my arrival in St. Petersburg, I immediately presented myself at the party organization headquarters, and after meeting the party leaders, went to the Vyborg district. There I met a good comrade, an underground Bolshevik worker, Simon Loktev. He had also come to St. Petersburg from a district of great revolutionary events only a week before and had already succeeded in learning all the party news. He told me that our Bolshevik leaders had decided to give full support to the unemployed movement which was then just beginning. He invited me that same evening to a meeting of the deputies from the district organizations of the unemployed, to be held in the Lesny district. A member of the Party Committee, Comrade Kairsky, was to speak at this meeting for the St. Petersburg group of Bolsheviks. We had some hours at our disposal before the meeting so we walked up and down the Sampsonevsky Prospect as we compared notes on the past events. We wanted to go into a beer hall, but the state of our finances and the fear of spies held us back. We got into a street car and went to the centre, to the Nevsky Prospect. Passing along the Liteini, on the upper deck of the street car, we watched the moving crowd, quite unlike the group we joined later in Lesny. We were hungry and would have liked to go to Filippov’s for some food, but an examination of our pockets convinced us that that was a pleasure we would have to deny ourselves. Strolling along the Nevsky, we watched the well-fed, contented bourgeoisie. Some-of higher rank-rode in magnificent carriages, with coats of arms and one or two splendid horses; others, a lower estate -a bourgeois crowd -moved on foot along the Nevsky, filling the centre of the city, along Sadovaya, along the Costin Row. They went into the stores filled with goods, came out with armfuls of purchases, and youngsters, laden with these purchases, dragged after them to their homes. All that there was in these stores, stands, and warehouses, produced by the proletariat, was quite accessible to the bourgeoisie. We also went several blocks up along the Nevsky but we could only look into the Soloviev store. We could not go in and buy even a quarter of a pound of sausage because the merchant Soloviev’s well-fed salesmen would not want to sell such small portions, and further, the price of sausage did not fit the size of our pockets. To relieve our feelings, we swore roundly, l inked arms, and turned away from this smug Nevsky. We went along narrow alleys and finally, at Basscin Street, found a cheap restaurant where the t\VO of us filled up on some kind of tripe for two kopeks. At 8 o’clock that evening, we sat in a country house at Lcsny where the delegates who were to consider the question of helping the unemployed had gathered and were waiting for the representative of the St. Petersburg Bolshevik group. This comrade was also the chairman of the Unemployed Com, mission. While we were waiting, we acquainted ourselves with the situation in the district. The majority of the delegates were members of our Bolshevik circles. All of them, of course, as the most active workers, had been driven from the factories and blacklisted. But they did not look as if they and their families had been thrown out on to the streets and were starving; the science of Bolshevism had taught them, above all, to control themselves and not break down no matter what happened. The chairman of the commission arrived, greeted us, and then turned to a student standing there, our host. He wanted to know if everything had been seen to, should the police or the gendarmes raid the place. The shaggy-haired student of the Lesny Institute looked for a second through the windows into the garden and then assured him that every emergency had really been provided for. Guards had been placed in the garden and the park. At the approach of the police, they would immediately inform us, and those who had gathered would have ample time to get away. The chairman of the Unemployed Commission laughed and said that they could be sure that they would not be taken either by the gendarmes or the police, for they would have to be fed in prison and the bourgeoisie had dismissed them in order to starve them to death. We got down to the business of the day. Our Bolshevik comrade started his report on the condition of the unemployed. The funds of the unemployed were exhausted. The levy on wages in the factories and mills was ceasing because the employers were obstructing the collection, and in some places, they had ordered the officers not to give the money deducted to the Soviet of Workers Deputies. The situation in the districts was desperate. “This, we suppose,” said the speaker, turning to the delegates, “you yourselves know well, but you must remember that such a situation threatens to last. Individuals and entire groups of ‘undesirable· workers are being turned out of the factories and mills. All that the unemployed had in the way of clothes and other valuables have been sold or pawned during this period. The term for redeeming the belongings is approaching and there is nothing to redeem them with. The things are being lost. The landlords are throwing the workers and their families into the streets without pity. There are thousands of such cases in all the workers’ districts. After he had finished reading the figures, the speaker urged that the delegates immediately organize an unemployed commission at each dining-room which would not only audit the accounts but would direct the business end of the dining-room and administer it generally. Further on, the speaker declared that the situation of the unemployed at the given moment was grave, but not hopeless. The delegates listened silently and very attentively to the speaker. When he had finished, others got up to speak. Each one welcomed the suggestions made by the Bolshevik organization and spoke briefly and clearly on how to realize them. All the proposals of the speaker were unanimously adopted. It was decided to organize an Unemployed Council by holding elections at the dining-rooms where the unemployed were getting their dinners, and a group of worker Bolsheviks were assigned to carry on the agitation for it and get the elections carried through. The council was to consist of thirty delegates from the unemployed. It was also decided at this meeting to print leaflets calling on the unemployed to organize themselves immediately as the only way out of the grave situation. This printed appeal of the Bolshevik group of workers actually made it possible to carry on elections to the Unemployed Council within a short period. Thirty representatives of the unemployed were elected to the Council. After several days, the first meeting of the thirty delegates took place and Comrade Kairsky was elected president. The general aims and tasks of the Unemployed Council are to lead the unemployed out of their unbearable situation. The most immediate task of the council is to get the city to organize public work for all the unemployed. The council is to rally all the unemployed around these aims on the basis of their common demands and arrange to send the delegates to the City Duma and subsequently seek other means of influencing the City Duma. After a number of organizational questions and suggestions on what further steps the council should take, the first meeting was adjourned. On the day following the meeting of the Unemployed Council, Comrade Kairsky and I went to Lenin to report to him what we had done to organize the Unemployed Council. Vladimir Ilyich  heard what we had to say, and then said he had some doubts as to whether the Unemployed Council alone could fulfil its programme by its own efforts. At the next meeting of the council, at which the appeal to the Duma was drawn up, it was resolved, in accordance with Lenin’s suggestion, to include thirty delegates from the large factories and mills in the Unemployed Council, and elections were held among the employed in all the factories, mills, and workshops. Later, the Unemployed Council was further enlarged and district councils were organized in the Nevsky, Moscow, Narvsky, Gorodskoy, Vasileostrovsky, Petersburg, Vyborg, and Kolpin districts. An executive council of the unemployed and a general city meeting of the Unemployed Council were organized. Delegates elected by the unemployed at general meetings, one for every 250 workers, and from factories and mill districts constituted the district councils. The district councils managed the dining-rooms, collected money in the factories and mills, registered the unemployed, gave material help, etc., and generally conducted the whole campaign in the districts for the struggle for bread and work in accordance with the directions given by the general city meeting of the Unemployed Council. The Executive Committee consisted of three representatives from every district council, three representatives from the unemployed, and three from the employed. The Executive Committee was to keep in touch with the Duma bodies. All questions which were to be raised for discussion in the Unemployed Council were first taken up by the Executive Committee which was empowered to carry out the general decision of the Council. Although he had not ordered the troops to fire, the killings destroyed the centuries’ old belief among common people that the Czar was the “Little Father” who had their interests at heart. It sparked off a wave of strikes and terrorism throughout Russia. By the end of January over 400,000 people were on strike. The Czar’s uncle was assassinated in February. Under the direct leadership of the Bolshevik Party, the St. Petersburg Unemployed Council began to prepare for the first offensive on the St. Petersburg City Duma. Cert2. in preparations had to be made to win the whole-hearted support of the masses of the workers for the unemployed in their attack upon the City Duma. Besides the agitation, it carried on in the districts, the Unemployed Council published a number of appeals to the employed well as to the unemployed. The petition had the thorough sympathy of all the workers in the factories and mills. It was discussed at the general meetings in every factory and afterwards signatures were collected in the shops. Speakers were sent to the factories where after the victimization and lockout only less class, conscious workers were left. Our speakers went with groups of the unemployed, stopped the workers as they left during dinner-time or in the evening during the change of shifts, and held factor gate meetings on the questions of unemployment and the help which should be given the unemployed. The meetings were always successful. Brief resolutions on the necessity for helping the unemployed were made and signatures were collected for the petition. But beside raising the spirits of the masses of the workers, which it undoubtedly succeeded in doing, the Unemployed Council had also to rouse a desire among the petty bourgeois groups to help the unemployed. The Unemployed Council managed to interest a number of liberal newspapers in St. Petersburg in this work. Comrades who had connections with the liberals on these papers were commissioned to speak with the more liberal among them in order to get them to help by writing articles and announcements in their papers. Tovarishch, on which Kuskova and Propovich then worked; Rus, led by the liberal son of Suvorin; the Cadet paper, Sovremennoye Slovo; and even Birsevka all published announcements and articles on the unemployed movement in which they advocated the large-scale organization of public work. They supported the unemployed because their petty, bourgeois readers brought serious pressure to bear upon them to do so. The armies of a hundred thousand unemployed had seriously alarmed the petty bourgeoisie. This tremendous mass of starving people, they reasoned, would spread various epidemics which undoubtedly would first affect those petty officials, office workers, etc., who came in contact with them in the course of their work. Sympathy for the unemployed movement increased daily in all districts, factories and mills. Nuclei of the Unemployed Council were formed in factories and mills. District councils were organized. Committees were set up to investigate the condition of the unemployed and to help them in their struggle with the City Duma. But at this point we found ourselves up against unexpected enemies of this proletarian work in the persons of the Mensheviks. 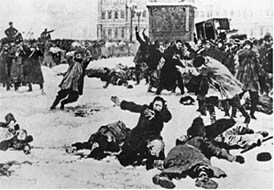 As soon as they saw that we had attained considerable influence among the masses and had created a competent body to lead the masses, the Mensheviks on the St. Petersburg Party Committee- Bolsheviks and Mensheviks belonged to the same party at that time-began to oppose us and, particularly, the Unemployed Council. They carried on a campaign against us in all the districts and tried to disrupt our unemployed organization, or at least to arrest its development. But the Mensheviks’ efforts were a complete failure in the workers’ districts since we had already created a strong organization there, and not a single worker, even with Menshevik leanings, supported them. The Menshevik speakers were howled down at all meetings of the workers in the factory, and in the districts, whenever they attacked the Unemployed Council. Then they transferred their Menshevik tricks to the leading organ of the party, to the St. Petersburg Committee in which they then had accidentally an insignificant majority. In the discussions of this question in the committee, the Mensheviks expressed the opinion that the Unemployed Council, led by the Bolsheviks, was provoking the workers to premature action, that the organization of the unemployed was a Bolshevik stunt. Our petition, which had already been circulated through all the districts and factories and had received thousands of signatures, was much discussed at this meeting of the St. Petersburg Committee. The Mensheviks demanded the deletion of the concluding words of the petition: “If you do not accede to our demands, we will report your refusal to the unemployed and then you will not have us to deal with, but those who sent us, the masses of unemployed.” They then demanded categorically that the unemployed delegation be restrained from going to the City Duma. They also opposed the demand for the organization of public work because, they said, the City Duma could not give the unemployed work-that had to be done by the State. The Mensheviks also strongly opposed the election of representatives from the factories and mills to the Unemployed Council because they saw in this a revival of the Soviet of Workers’ Deputies. In conclusion, the Menshevik leaders insisted that the St. Petersburg Committee forbid us, the Bolsheviks, to work among the unemployed and to develop and strengthen this organization, and in the event of our persisting in this, that we be expelled from the party. The leaders of the unemployed told the Committee that such a decision would be harmful to the proletariat and not binding on them, and therefore they would not submit to such a decision. The Committee decided to meet the next day to take up t h is question at an enlarged meeting. The enlarged meeting, it is true, was called on the designated Jay, but it was after April 12, after we had already won all our demands from the City Duma. This caused a split in the Menshevik ranks and those opposed to us were left in the minority. No decision against us could be arrived at. After extensive preparatory work for helping the unemployed had been carried on among the petty-bourgeois groups, the Unemployed Council elected a delegation which was to go to the City Du ma on March 2S to deliver the signed petition mentioned above. The delegation consisted of fifteen members, and on March 28 it went to the St. Petersburg City Duma. The town councillors looked with surprise at this group of workers. The mayor invited the delegates in to his office in order to learn what they wanted, but the delegates ref used to speak with him, declaring that they had been commissioned to take the matter up with the City Duma and not with individuals. There was no meeting of the City Duma on this day, since only a few of the town councillors had appeared; the other members had received the information that some kind of delegation had come, and had deliberately stayed away from the Duma session. The delegation left, but informed the town councillors and the mayor that they would come again to the next session. The next regular session was to take place on April 12. Consequently, the Unemployed Council had still two weeks at its disposal to prepare more thoroughly. Agitation was renewed in all the factories and mills and this roused the employed workers to come out even more strongly in support of the unemployed and increase the number of signatures to the petition. The Bolshevik speakers from the Unemployed Council went to all the factories and mills with groups of the unemployed, arranged meetings and got resolutions passed. During this time not only did the Bolshevik paper Volna carry on a campaign for the movement, but so also did some liberal papers, which carried a number of articles favourable to the unemployed organization and urging the necessity for the City Duma to start public work for the unemployed. Public opinion was greatly alarmed by the question of unemployment. Even the whole group of electors  to the State Duma decided to support the delegation of the unemployed to the City Duma. City Du ma, the police suddenly raided the premises where the Council had met formerly am! arrested everyone there. But there were no delegates or members of the Unemployed Council among them. Before receiving the delegation, the City Duma held a private session and decided to admit the delegation and to accede to their demands as far as possible in order not to exasperate the workers. This decision was not known to the general public and the unemployed. At the beginning of the session, just as we arrive, great numbers of people came into the Duma chambers. Five rep­resentatives spoke for the Unemployed Council, and they did not mince words. We ask nothing of you; we demand!” said one of the speakers. “We think that all the money at your disposal rightfully belongs to us.” “If you do not give work to the unemployed, nothing remains to us but to rob you,” said another speaker. The town councillors listened patiently even to such speeches, and when we had finished they suggested that the delegates leave the hall. Bu t we declared that we would not leave until we had received an answer to our demands. Then the town councillors announced an intermission, cleared out the general public, and then resumed the session with the unemployed delegation present. Councillor N. N. Shnitnikov was the first to speak, and as the most Left radical of the town councillors he read the town council’s estimates of the work that could be given to the unemployed. To engage 200-400 workers during June of the current year on constructing canals and filling up the Catherine Canal. To engage, beginning with May of this year, on the Hallerna Harbour, 300-400 persons on mechanical work, and 2,000-2, 500 on hand labour. To engage 100 persons on the work of regulating the Karnovki River in the near future. To engage 300 persons on the construction of a Labour Exchange, the Lotzman Market, and a lodging­ house. To engage 400 persons on casual work. Thus the town councillors calculated that at most there would be work for some 5 ,000 persons- 500 skilled workers on different types of work and 4,000 common labourers, with­ out counting the workers who would be needed for the construction of bridges or the number which could not be calculated. Certainly, the City Duma were, as before, hostile to the unemployed movement and to the unemployed generally. But the Bolshevik organizations and the Unemployed Council had succeeded in raising a strong sentiment in favour of the unemployed among all the petty-bourgeois groups and particularly among all the St. Petersburg workers. Therefore, the town council was forced to conceal its hostility behind this ostensible desire to help all the unemployed by organizing public work. In their speeches, the town councillors said that the unemployed were justified in their demands, and declared that charity was a most pernicious form of helping persons accustomed to earn their bread by honest labour. They also said that public work did not lower the dignity of the unemployed; on the contrary, it raised their morale, and therefore it had to be developed first. To set up a special committee of twelve members to draw up a plan for the organization of public work and to devise measures to prevent distress caused by unemployment. That the committee co-opt representatives of the workers and those organizations which were heard at the previous meeting, to participate in its work. That the committee consider all the proposals made by the town councillors at the present meeting. To apply for permission to establish an executive committee consisting of a chairman and twelve members to manage the organization and performance of public work. The answer was that the 500,000 was only a beginning and that later the Duma could even advance a million and a-half, or more if necessary. The delegation answered that they considered the question settled and they would take part in the work of the preparatory commission. The city commission and the representatives of the unemployed set to work on the following day. It was decided to investigate the help that was already being given to the unemployed: to find out how many dining-rooms there were and to increase their number. A large number of the unemployed, thrown on the streets, had found shelter in lodging houses, but their children had been sent to stay with comrades who had remained at work; families were thus broken up. It was decided that some action would have to be taken to help the unemployed pay their rent. The question of helping the unemployed to redeem their belongings from the pawnshops, particularly sewing machines and underwear, was also dis­ cussed and decided in the affirmative. To give the town council the right to exempt the unemployed from paying certain local rates on application from the commission. To permit no unredeemed property in municipal pawnshops, belonging to the unemployed, to be sold before June 21. Also, to cancel fines for arrears on interest and to postpone the payment of interest for three months. The commission and the Unemployed Council immediately started distributing this money among the unemployed. The 175,000 roubles were spent within the first two months on food, rent, and the pawnshops. The organizing end of the expenditure of money was left to the commission which, with the consent of the Unemployed Council, transferred this function to the union of engineers which had organized a committee to help the unemployed six months previously. The Unemployed Council retained the right to control the activity of this committee and the general management of the work. The Duma commission was to receive the money from the city treasury, transfer it to the committee, check its account, and then make a report in the Duma. The difficult work of organizing dining-rooms for the unemployed fell to the commission for feeding the unemployed. During this period, the committee opened 33 dining rooms and furnished three million dinners to the unemployed. The number of dinners distributed in June was 495,000; in July, 631,000; etc. In June and July, there were 16-20 thousand dinners daily. The Unemployed Council decided not to take this difficult work upon itself because that would divert much of its strength which it needed for other agitational and organizational work. The money to help the unemployed pay their rent came directly from the town councillors of the Duma, and was paid out according to lists drawn up by unemployment councils with a member of the executive committee of the Unemployed Council, or representatives from the district council, supervising. The town councillors and the representatives from the Council assembled all the unemployed in the district who were to receive relief and gave them money against receipts. Many of the unemployed were illiterate, and some placed crosses, some signed for others, etc. “No, there is something criminal going on. You are unemployed Bolsheviks; the devil knows what you are doing with us. I sent the working woman away and said sharply that nothing criminal had been done and that there was nothing to be irritated about. We only laughed. The workers dispersed, swearing at the working woman who could not remember the name under which she was to receive money. But this was the only case which enabled the town councillors to know that we had substituted some persons for others. Actually, there were many such cases. We did this regularly and were able to support all the strikes that broke out in St. Petersburg in 1906 and part of 1907 in this way. We carried on the majority of the strikes, and the greatest of them, the strikes of the dockers, the cabmen, the Erickson telephone factory, and others, with the City Duma’s funds. The town councillors would look up, somewhat surprised, but then would go on with the disbursements. Two and a-half years later, after I had returned to St. Petersburg from prison, I met the secretary of the Duma com­ mission. He asked me to step into the Duma building. I had been outlawed, but he promised that they would not give me up. In the office of the commission, I saw our lists with the crosses; they were spread out on large tables. I wished them success and left the commission. Two weeks later this same secretary informed me that the audit commission had decided to put in only a provisional report on these accounts, as it was impossible to make head or tail of the accounts and that after the report of the town council was made, it would be put into the files. The Unemployed Council not only organized dining-rooms, supplied food, advanced money for the payment of rent and for redeeming goods from the pawnshops, but spent all of April and May in the preparation of public work, and kept hammering away at the unemployment commission, at Councillor Kedrin and the City Duma, to get them to accelerate the organization of this work. But the City Duma began to change its attitude to the unemployed. The Cadets and the Black Hundreds who had appeared so eager to help on April 12 began to obstruct the starting of public work as much as possible. They had gotten over the fright they had had when we invaded the City Council, and now wanted to limit the aid to the 500,000 roubles that were then voted. The crafty lawyer Kedrin was carrying out his instructions from the capitalists to lead the workers by the nose and postpone a decision on the pivotal question of organizing pub ic work. The police and the secret police began to interfere considerably with the unemployed organizations. Consequently, there were sharp clashes almost every week between the commission and the Unemployed Council. Finally, the Unemployed Council presented the following resolution to the commission in the name of the unemployed of St. Petersburg. This resolution was sent to the City Duma, but it had little effect; Kedrin took no steps whatever to accelerate the work. Finally, the Unemployed Council informed both Kedrin and the Duma in a special resolution that it found the further presence of Kedrin in the commission injurious to the proper organization of public work and insisted that Kedrin be removed from the chairmanship of the Commission. At that time, there were a number of other clashes with Kedrin and he was fon:ec.1 to send in his resignation. The first unemployment commission consisted of important servants of capital–Lawyer Shritnikov, Planson, Kedrin, some engineers and one teacher, Falbruk. These were the people who considered themselves defenders of the interests of the masses. And if we, sitting at one table with them, had not had Bolshevik revolutionary schooling, but had watched them and listened to them with open mouths, instead of fighting with them, they would have undoubted y hypnotized us from the very beginning and the work of the organization of public work would have been ruined. Therefore, when the most outstanding capita list lawyer, Eugene Ivanovich Kedrin, realized tha.t it was impossible to fool us, and openly came out for postponing public work, he was thrown out of the commission with public censure. And we continued our Bolshevik line of demanding public work. With the help of the technicians in the engineers’ union who sympathised with us and had connections in the City Duma, we found the projects for work which the Du ma had drawn up in the technical files of the Duma. We ourselves is covered projects in the City Duma files amounting altogether to 5,600,000 roubles. We found nine complete projects for new bridges for St. Petersburg over which electric trams were to pass. These bridges were: Mikhailovsky, Silin, Viedensky, Kamrnno-ostrovsky, Pantclei­monovsky, Kharpovitsky, Rizhsky, Alarchin, Varshavsky. We pulled the projects for the construction of three new markets out of the files-Sitnikovsky, Lotsmansky, and Arsenal, as well as completed projects for the construction of a slaughter house, for the Novoderevensky water supply scheme, a project for raising the Halerna harbour, the heating of the tram shed, the construction of trailers, motors for cars, cables for the trolleys, etc. Some of the work we conceded could not be done by the unemployed but most of it we resolved to use, since the unemployed could handle this work. There were many killed workers among us-fitters, boiler-makers, joiners, carpenters, turners, etc. The work which we had in mind would need 6,000 persons, and besides that, there was work to be done on the raising of the Halerna harbour which would last over a considerable period. When we started to work out in the commission the form this work was to take we found ourselves up against the obstinacy of the commission, particularly of those councillors who had social-revolutionary and national-socialist party leanings. These socialist town councillors insisted, and the whole commission supported them, that we take the work on an artel  basis, that we organize all the unemployed according to their specialty in artels, and, after receiving the necessary number of engineers and technicians from the union of engineers, start this work on contract. They insisted that other, wise the Duma could not give its consent, because some juridical person must be made responsible for work involving such large sums. It was impossible to simply give the work over to someone without entering into some kind of contractual relations, the town councillors argued. In a word, the lawyers, the members of the commission, the capitalist officials, although they claimed to have socialist earnings, nevertheless regarded themselves as representatives of the bourgeoisie and proposed forms of work which would best serve those interests. Planson was the chief initiator of this artel device. He worked out all these forms for carrying on the work, introduced an arbitration court for settling disputes, the forms of receiving this work, etc. Some members of the Unemployed Council, who were influenced by the Mensheviks and Social-Revolutionaries, were in favour of accepting this form of work. But the Council as a whole and its executive committee realized that work carried on through contracts would be a great misfortune for the unemployed, and perhaps would even result in a complete breakdown of all the public work the promise of which had been obtained with such effort by the St. Petersburg proletariat. First, it would be necessary to organize the unemployed into a legally competent artel. By the time, we had done that the work itself would have slipped out of our hands. Finally, the workers in taking on themselves the whole burden and responsibility for these artels might not be able to set the work going immediately and might spoil some jobs, and thus give the unemployment commission and the town councillors a pretext for stopping public work altogether. Therefore, we discussed at great length everywhere how work was to be done; we discussed it in the central and district unemployed councils and in the factories and mills. It was only after we had thoroughly considered this question that we brought it for decision to the Unemployed Council. The Unemployed Council categorically opposed having the unemployed doing the public work on an artel contract basis. On May 7, it decided, instead, to demand that the City Duma take the full responsibility for carrying on the work. Establishment of a daily wage. Observance of all necessary sanitary and hygienic conditions at work. Employment to be given to the registered unemployed at the indication of the Unemployed Council. The right to control ail the internal affairs in the workshops by workers’ representatives. The Unemployed Council’s rejection of the artel-contract form of work exasperated the City Duma. The town councillors insisted on our carrying on work through artels and even threatened that if we did not agree to carry on the work in this manner the Duma would not organize any work at all. By this time we had reason to suspect that the Duma would not carry out its decision of April 12. All the Black Hundreds began to organize energetically against the Unemployed Council. The press, liberal as well as Black Hundred, began to criticize us severely and stir up feeling against the unemployed. The whole capitalist press took advantage of our refusal to accept work on the artel contract basis to attack the Bolsheviks, and argued that we, the Bolsheviks, were using this movement of the unemployed for our political aims. The Unemployed Council took every opportunity to expose the insolent conduct of the capitalist, and particularly the Cadet press and their attempt to defend the interests of the bourgeoisie to such an extent that they were even ready to disrupt the public work which had already been decided upon by the St. Petersburg Duma. But a number of papers were still with us and we also had our Bolshevik paper Volna and another through which to carry on the struggle. Through them, particularly through Volna, we exposed the monstrous conduct of the Cadet and liberal press and succeeded somewhat in dispelling its effect. Thus the whole of May passed. The beginning of June found the state of the organization of public work but slightly changed and the problem unsolved. Nothing was left for the Unemployed Council, and its Executive Committee, but to start, with the help of the Bolshevik Party organization, an active campaign in the factories, and to bring pressure to bear through the masses of the workers on the government and on the petty-bourgeois groups, and particularly on the City Duma. Since our organization continued to grow stronger and was able to bring continuous pressure to bear on the St. Petersburg authorities, the Duma had to elect some additional town councillors to the commission. On May 29, it commissioned this enlarged Executive Committee on the organization and management of public work to do whatever work there was on hand in the city. By this time we had come to the end of the money which the City Duma had released for the maintenance of dining­ rooms and for other forms of relief to the unemployed. But the Duma did not make fresh grants. Rumours were current that the Ministry of the Interior had sent instructions to the City Duma not to make many concessions to the unemployed. The situation grew very serious. We increased our pressure on the commission through the press. We adopted a number of other measures. We began to activate the movement of the unemployed. The unemployed were in an extremely grave position. We forced the Duma commission to report to the City Duma on how serious it was and to demand or “beg” funds in order to keep the dining-rooms going throughout the summer. The group managing the dining-rooms estimated that 180,000 roubles were needed for three months for 18,000 dinners daily at 15 kopeks a dinner. In addition, we made the commission go to the Duma to ask for money to help the unemployed pay their rent- 12,000 families for three months- 180,000 roubles. We demanded in all 360,000 roubles for the summer. The unemployed comm1ss10n drew up its report along these lines and presented it to the Duma. But the Duma did not intend to take it up; nor did it hurry to begin work. We raised a row in the commission and demanded that a special meeting be convened. A special meeting was held and through it we brought pressure to bear on the Duma to assign money for the payment of relief and, chiefly, to organize public work. To reaffirm the right of the executive commission to give all the work which had been already contracted for, or for which the Duma’s permission was not needed, to the unemployed. To propose to the city council and the executive commission that only work which the commission on the organization of public work does not thin k it can carry on itself be given out on contract in the future. But soon we learned that this decision affected only repair work, and the organization of public work, even after this excellent resolution had been adopted, got no farther. Days and weeks passed. General weekly meetings of the unemployed, and especially of the workers in the factories and the mills, were held to discuss the situation, and resolutions were passed censoring the disgraceful conduct of the City Duma in regard to the unemployed. The Duma was bent on delaying and nullifying all efforts to get this work done. The executive commission grew so bold that it even decided not to invite the representatives of the Unemployed Council to the meetings. The Unemployed Council at its meeting on May 31, 1906, decided to bring matters to a head. A resolution was passed, calling for a joint meeting of the executive commission, the representatives of the Unemployed Council of the union of engineers, and of the central bureau of the trade unions. This resolution was transmitted to the executive commission but, at the insistence of the Black Hundreds, it ignored it. Again, a general city meeting of the Unemployed Council was called. Again, it was decided to demand that the executive commission say whether it would carry on the public work or not. But the unemployment commission ignored these resolutions and decisions of the proletariat. “The Unemployed Council does not hide from the masses that the Duma is only procrastinating, is only playing with the unemployed and has no intention whatever of keeping its promises. But the Council has not broken its contact with the Duma because to do that would mean to play into the hands of those who want to provoke the workers to premature action. This is exactly what the enemies of the working class, thirsting for proletariat blood, are waiting for. to premature action at the time when the employed comrades are not ready to help them, and the Duma, of course, does readily what the Ministry wants it to do. However, we shall not allow ourselves to be provoked by the Duma. We know too well that the sight of the workers’ blood does not frighten our enemies but makes them rejoice. We know this too well to take thoughtless action which would enable those who want our blood to rub their hands and say: ‘Our ruse was successful. The workers will not forget this lesson quickly, will not recuperate quickly, will not renew their organization speedily.’ “We shall not give the provocateurs this pleasure. Nothing drastic is to be done as long as the Unemployed Council does not call on us to do so. When this draft of the leaflet was read in the Unemployed Council, some sections of the Council, of a more anarchist, social- revolutionary spirit, were dissatisfied; they did not think it resolute enough. There was a split. They demanded that the Council take more resolute steps, force the Duma, etc., etc. But the dust raised by the anarchist social-revolutionaries was swept away when a vote was taken. The Unemployed Council decided to send a delegation to the Duma, and to keep its decision a complete secret. They assembled on June 12 and elected a delegation of eighty members, five representatives of the unemployed and five of the employed from each district. The delegation was to go unaccompanied by the masses, and was to get a clear and definite answer from the Du ma whether there would be work or not. And at 2 p.m. on June 12, a delegation of 75 persons gathered and set out for the Duma. It divided up into two groups of approximately equal size, each with a leader to direct and advise it. The first group was to come through the treasurers’ entrance, through the right door; the second was to make its way into the Alexandrov Hall and enter the meeting hall through the left door. Both groups were to come into the hall noiselessly, at the same time and in absolute order, with the leaders at the head. Having occupied both exits of the Duma, the delegation groups must come together in front of the Duma tribune; its representatives must address the Duma and all the speeches must end with the question: Will the unemployed workers be given the public work promised them, or not? This plan was really a success, though the group which was to come through the left door, through Alexandrov Hall, was one minute late. One door was left unguarded and the town councillors were quick to take advantage of this accident. As won as they saw some forty persons coming through the right door, the Duma chairman adjourned the session and all rushed towards the left door. But at that moment the other group appeared from Alexandrov Hall and entered the Duma meeting hall. But the town councillors would not listen; they made their way past the delegation into Alexandrov Hall and jostling each other, forced their way to the door. The workers’ representa­tives followed them. While these negotiations were going on, someone who noticed that the Duma was surrounded by the police, soldiers, and Cossacks rushed to the Minister for the Interior for an explanation. The City Governor, it appeared, had informed the Minister that the workers had appeared in the Duma armed with clubs and other weapons, had surrounded the Duma, and were beating up the town councillors. This report was telephoned to the City Hall and Kedrin repeated it to the people assembled there. This caused a roar of laughter. We immediately collected about twenty canes and umbrellas which we carried, counted them, and offered them to the town councillors, but they ref used to take them. “No, we’ll give up our weapons,” we declared laughingly. “Inform whomever it may concern that the representatives of the proletariat in the City Duma have disarmed themselves,” and our comrades gave the umbrellas and canes to the commissionaire. By this time, the chief of police, some police officers, and a body of policemen had appeared in Alexandrov Hall. The Duma looked like a military camp. No one was permitted to leave or enter. The Unemployment Council delegation stepped to one side to consider the situation and decided not to leave the place nor to enter into any negotiations with the town councillors unless the police were removed and the delegation was heard. The town councillors insisted that the mayor and the chair­ man of the City Duma, Dimsha, ask the governor to withdraw the police and the guards from the City Duma. The mayor and Dimsha said that they would immediately request that the police be withdrawn from the Duma. The delegation answered that it did not ask them to request this on their behalf but for their own sake, so as not to be ashamed of themselves afterwards. The mayor and the chairman Dimsha went to the Governor and from his office informed us that the Governor had heard that a crowd of workers had broken into the Duma and were beating up the town councillors. Within five or ten minutes, all the armed forces were with· drawn. After that, in more peaceful conversations, the Duma came to terms with us. The Duma agreed to receive a delegation from the Unemployed Council on June 14, but only a small one. On that day, the executive committee of the Unemployed Council decided to send a delegation of fourteen persons, two representatives from each district; only two of them were to speak in the Duma. The delegation was commissioned to negotiate skilfully and not give the Black Hundred any excuse for breaking up the meeting of the Duma. Having heard our communication, the Duma decided to give the representatives a hearing but would hear the delegates from the unemployed only as experts, so to say. When one of us, who was to speak before the Duma on July 1 4, began to approach the Duma tribune in order to speak from it, Dimsha stopped him and insisted that he remain below. We were not proud and agreed to say what we had to say from the floor. The next speaker emphasized the same thing in a different way and put the same question-“Will you start public work or not?” Then a third speaker spoke, the one commissioned by the Executive Committee to warn the Duma of the results that might ensue if it refused to organize public work. This speech aroused the town councillors to protest. The chairman kept ringing his bell. Many times, he stopped the speaker, but our representative, having finished his speech, took out a paper and began to read the demands. The chair, man abruptly cut him off and declared that the Duma would not listen to demands. So, our speaker agreed to call these demands “points” and then began to summarize them without any further objections from the chairman. To organize public work immediately. To extend the authority of the executive commis and give it the right (a) to find new work for the unemployed and execute it. (b) to satisfy the urgent needs of the unemployed by advancing help in the payment of rent, redeeming things in the pawnshops, etc. To assign immediately the sum demanded for the satisfaction of the needs of all the unemployed of St. Petersburg. After these points had been read, Dimsha demanded that the workers leave the hall. When we acceded to this demand, the town councillors, under pressure from the liberals, decided to permit us to sit behind the railing while a decision on this question was being reached, in spite of the fact that the chairman, Dimsha, had demanded that we leave the hall. But the town councillors, raising their eyes to the railings, and seeing that no one supported them, said hastily: “No, no we are for it, for the proposal of the commission to assist the unemployed”. To assign during the summer the sum of 360,000 roubles for the maintenance of dining-rooms for the unemployed and to help them pay their rent. To postpone for three more months the sale of the u n redeemed property of the unemployed. To commission the mayor to propose to the Minister for the Interior that additional expenditures for giving work to the unemployed and supplying them with food and other necessities be defrayed by the public treasury. Thus, the money was obtained, and immediately afterwards permission was given to start the first of the public work, the lifting of the Halerna harbour, to save it from being sub, merged. After our visit to the Duma on June 14, the organization of public work advanced considerably. For a number of political reasons, the government did not want to arouse a large organization of the proletariat, such as ours was, and had ordered the Duma Black Hundreds to make concessions. Money was assigned for food, rent, and the other needs of the unemployed and the executive commission was commissioned to organize public work. But this did not mean that we had actually received this work. We had to continue to bring pressure to bear on the Duma councillors. In this way, we approached our goal. The Halerna harbour, the district where the flood was rising, had to be lifted in some places by half a met re and in others more. If this were done by hand labour and not by machine, some thousand workers would be needed. We had precisely such work in mind, i.e., hand labour, and towards autumn this work which gave employment to more than 1,000 persons was begun. Further, we organized public workshops for making parts of bridges and other metal constructions on the Kagarinsky wharf on the St. Petersburg side. We engaged 1,500 workers on two shifts in these workshops. The locked-out unemployed, who represented in themselves a united mass and were the leaders of the unemployed movement, were concentrated in these shops. Towards the end of 1906 we started a number of other jobs such as the erection of masonry on the Panteleimonvsky, Mikhailovsky and Varshavsky bridges. All the St. Petersburg proletariat, through the organized Unemployed Council as well as the district councils, followed the course of this work, heard almost daily reports on it, d is­ cussed it, and gave further directions and pointers. For the two years during which public work was carried on, the St. Petersburg workers actually organized and led the industrial undertakings, assigned people for it, saw to it that the best people were to be had, and supervised the work. In a word, they lived their industrial life and tried to raise the level of production to the necessary height. When public work began to break down because it turned out to be extraordinarily ex­ pensive, unprofitable, and unable to compete with other enterprises, the Unemployed Council raised the question and called upon us who were managing the work to find out how to make the work pay. The deputies’ committee of the Kagarinsky wharf, in accordance with the instructions of the Executive Committee of the Unemployed Council, introduced a form of piece work which did not violate the collective interests of the proletariat. This enabled us to reduce the cost of hiring the building from 7 roubles per unit which it had cost until then, to 2 roubles, 80 kopeks. With the eight- hour working day and the self-organization of labour, in with the committee of deputies directing the work in the name of the Unemployed Council, this was certainly a great achievement. This saving of many thousands of roubles by the St. Peters, burg proletariat was of great educational value for the working masses of St. Petersburg, and now we can say that many of the present leaders of the Soviet Government and of Soviet industry received their first practical lesson at this work. The question of production, of the organization of production, of technical leadership, etc.-questions which under other conditions could never have arisen-became for the first-time practical issues for the proletariat of St. Petersburg. Moreover, this public work helped us to preserve the unity of the proletariat at a time when reaction was blackest, and to advance its revolutionary education. With the organization of the Unemployed Council we developed a number of successful strikes which embodied the spirit of the proletarian masses and developed its class consciousness. During a period of reaction, of lockouts, of unemployment, savage antagonisms are aroused between the employed and the unemployed in a capitalist country. During this period, throughout the two years of existence of the Unemployed Council, we succeeded in finally removing every trace of antagonism. In the course of its two years’ existence, the unemployed organization gave the proletariat a thorough schooling in industrial and economic matters. This organization, which furnished many leaders, not only taught them to organize production, direct it and achieve success, but it taught them how to fight against the capitalists in everyday problems, even while sitting at one table with them. It taught them how to stick to their independent correct revolutionary line and to attain their class aims. During the second half of 1907, reaction became blacker and blacker. The majority of our party workers were arrested. Others, tearing themselves out of the ring of the Stolypin siege, fled abroad. And in prison or free, they began to observe the great decline of revolutionary activity. The case of the Unemployed Council was a good example of the state of affairs. The majority of us, organizers and leaders of the Unemployed Council and the city public work, were also arrested or went underground. All the work of the unemployed of St. Petersburg was weakened; part of the unemployed at that time were absorbed by the factories of St. Petersburg and other ci ties. In the first half of 1908, I was informed in prison that the tsarist government had put an end to public work. But when the government proceeded to close the public workshops on Kagarinsky wharf , they were so scared that before the gendarmes set about their work, they called out a battery of light artillery, in case of any emergency. Lenin’s first and middle name, by which he was popularly known. In Russia at that time an indirect system of electors was in operation. ‘The voters did not vote for candidates to public bodies, but voted for electors, and these voted for other electors who finally voted for the candidates. A group of workers working together. This proposal would have converted the unemployed into private contractors.